KEF is a British company that manufactures loudspeakers. Their distribution is worldwide. The company was founded in Tovil, Maidstone, Kent. It was founded by Raymond Cooke, an electrical engineer, in1961. The name comes from Kent Engineering & Foundry as the website states. The founder of the company, Raymond Cooke, was made OBE by Queen Elisabeth II in 1979. Nowadays, the owner of the KEF is GP Acoustics, a company that is a member of Gold Peak Group based in Hong-Kong but the research and the manufacture of their flagship products is still placed in the Tovile site in England. The Q100 is basically a smaller version of the Q300 bookshelf speakers. However, don’t be fooled by the size of these speakers, these speakers are made to boom. They feature a point-source Uni-Q driver array, made for a 3-dimensional and extremely accurate sound that envelops the entire room. The acoustic center is the 5.25-inch Uni-Q driver array with a 1-inch dome tweeter made of aluminum. The Q100 offers an incredibly fast and clean midrange response as well as the distortion-free power handling and increased sensitivity. The speakers are under a 1 foot tall which makes them perfect for a bookshelf, home entertainment system, or any small area in your home. They can also be paired with other speakers and home theater systems from KEF’s Q series, ensuring an outstanding sonic experience. Amongst the most prominent features is most definitely the 5.25 inches Uni-Q driver array that has a 1 inch vented dome tweeter made of aluminum in the center. This driver can easily handle frequencies from 49 Hz to 40 kHz that come from a single source. The above-mentioned driver produces an incredible 3 dimensional sound that is extremely accurate and can easily envelop an entire room. The large tweeter increases the sensitivity and offers a distortion-free power handling, while the driver array ensures incredibly clean and fast midrange response. These speakers can additionally be paired with the center channel, floor standing speakers, and subwoofers as a home theater system, as long as the other speakers are from KEF’s Q Series to ensure an outstanding sonic experience. 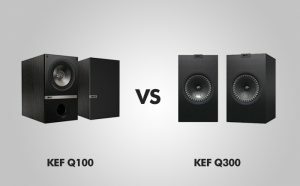 The KEF Q100W Bookshelf speakers are sold in pairs and the price is a little bit above $380. That might sound a bit too much for a pair of speakers, but considering the power and the quality of these, it is totally worth it. The KEFQ300 are the largest speakers of the KEF’s Q Series and the winners of multiple awards. They feature the very latest version of the well known KEF’s point-source Uni-Q driver array. They deliver a precise, spacious, and lush sound with an amazing high-frequency and midrange response alongside the solid and controlled bass. Whether you use them for your entertainment system, or a home theater, or as bookshelf speakers for your study room, these speakers will deliver amazing sound quality any audiophile will admire. The main feature of these amazing speakers is a 6.5 inches point-source Uni-Q driver array that enables these speakers to deliver an accurately dispersed sound that fills any room. You really can’t get that with other speakers. The driver array also has a rigid aluminum cone technology alongside the big 2inch voice coil that ensures distortion-free power handling, especially with low frequencies. The sound of these speakers is expansive and full. The separation is at the very high level, making it easy to locate each instrument in the mix, but it stays integrated and works together. The dynamics are quite impressive on these speakers. The jump from low volume to insane is so intense that it can knock you back into your chair. The Q300 also features a no-fuss competence, which is very nice. They’re eloquent in the midrange and pack plenty of low-end punch. When it comes to price, the pair of KEF Q300 bookshelf speakers is around $500. Expensive, yes. However, if you consider the quality and the power of these speakers, and the fact that these are multi-award a winner, the price is absolutely justified. You get what you pay for, and that’s a fact! Performance evaluation – what makes Q100 and Q300 different? Both of these models feature the same point-source Uni-Q driver array with the only difference being the size. The quality is impeccable on both models. They deliver an amazingly accurately dispersed sound that fills up the room. The bass frequencies sound nice, clean and distortion-free while the midrange and high frequencies sound compelling and solid. The overall sound of these two models is very lush, precise, and spacious. The only difference between these two, when it comes to sound, is the output power. The Q300 is much louder. When it comes to size, as you might have guessed, Q300 is larger and heavier. The dimensions of the Q100 are 30 x 12 x 16.5 inches and they weigh around 31 pounds. The dimensions of the Q300 are 32 x 13.3 x 19 inches and they weigh around 41 pounds. Basically, if you want to wall-mount your speakers, the Q300 is a bit too heavy and you have to decide whether you want to sacrifice the power in favor of weight. The Q300 is more than 100 dollars more expensive than the Q100, which is actually quite logical considering the power. With both models, you get what you paid for which is quite much. If the extreme loudness is not what you are looking for, then the Q100 wins this round. Comparing these two is not an easy task. The Q100 is basically just the smaller version of the Q300 and most of the features are completely identical with the only difference being the power and the size. The logical conclusion would be that the Q300 is a better option because of the higher power, but if you want your speakers wall-mounted, they might be too heavy, and that is where the Q100 comes into the picture as a better choice. The Q300 is also a more expensive option, so if the price is an important factor to you, the Q100 is more than 100 dollars cheaper. The truth be told, both of these speakers are excellent, and the choice only depends on your preference about the size, power, and the price.